The hardy volunteers of the CPC have a long association with Gaping Gill. We held our first meet here in 1931, when members completed a descent of the Main Shaft on wood and rope ladders. 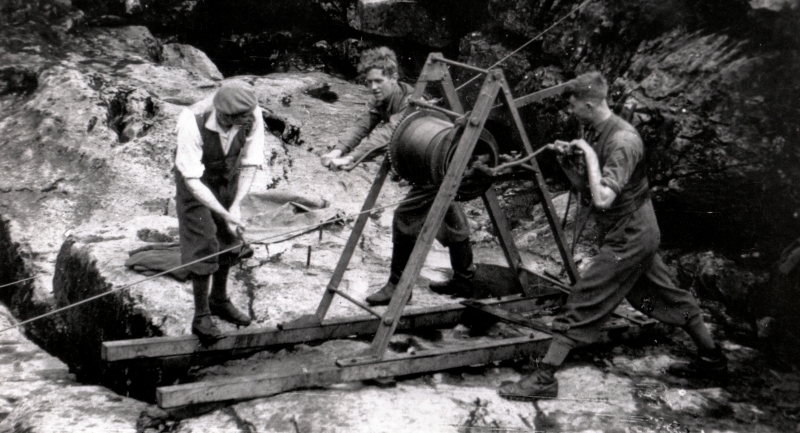 Convinced of the need for a winch, the club borrowed a wooden gantry belonging to the Yorkshire Ramblers Club and constructed a simple hand windlass for the first winch meet in 1932. While today’s meets are of an altogether more sophisticated nature Gaping Gill continues to provide a superb venue for one of the principal social events of the Club calendar. The Club Meet is spead over two weeks in August. The Tackling Meet, held over the first weekend sees us transport all the equipment necessary to run the meet onto the fell. There is no road access to Gaping Gill, so everything must be carried over the moor by tractor and trailer, with the help of the local farming community. A gantry is constructed over the open Main Shaft using aluminium scaffolding poles, and our purpose made hydraulic winch and its diesel power unit are fixed into place. Other activities include damming Fell Beck to divert water away from the Main Shaft, installing a gas-powered generator to supply lighting in the Main Chamber and setting up guide, power and communication cables. By Sunday evening the winch has normally been proof tested ready for operation and the banks of Fell Beck are heavily populated with personal tents and our communal marquees. The Meet proper starts on the second weekend and continues through until next weekend. We open the winch for descents by the public over this period. It is not uncommon to have upwards of sixty members and guests in camp over this period, making GG a unique event, particularly given its location. A crew of seven, plus a number of Main Chamber guides are required to operate the winch for public descents so there is plenty to do for new and old hands alike. Despite these demands there always seems to be time for socialising and sporting or digging trips. With all the Club's SRT and ladder tackle in camp the majority of entrances are descended and of course the winch provides an ideal opportunity to rope down the main shaft without the long climb out! No sooner has the last ascent taken place when the task of dismantling the equipment begins in readiness for transport off the fell. Then it’s then time to start planning for next year!